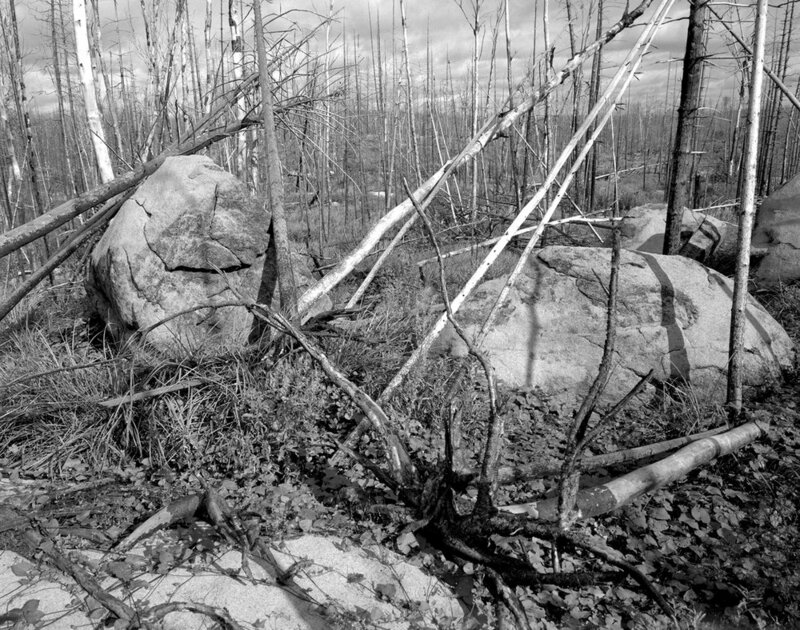 In Fall 2011, the Pagami Creek Fire, caused by a lightning strike east of Ely and the largest forest fire in the region since 1894, consumed nearly 100,000 acres of Minnesota’s Boundary Waters Canoe Area Wilderness within the Superior National Forest. I had to witness this landscape first-hand. Through networking, I connected with scientists, including renowned disturbance ecologist Lee Frelich at the University of Minnesota, who became my guides and mentors. In May 2012, I accompanied Minnesota Biological Survey ecologist Lawson Gerdes to visit the severely burned area around Island River being studied by researchers from the Universi­ties of Wisconsin, Iowa and Minnesota. I photographed several sites, beginning a long-term project to visually record how the landscape has responded to and is recovering from the effects of the fire. 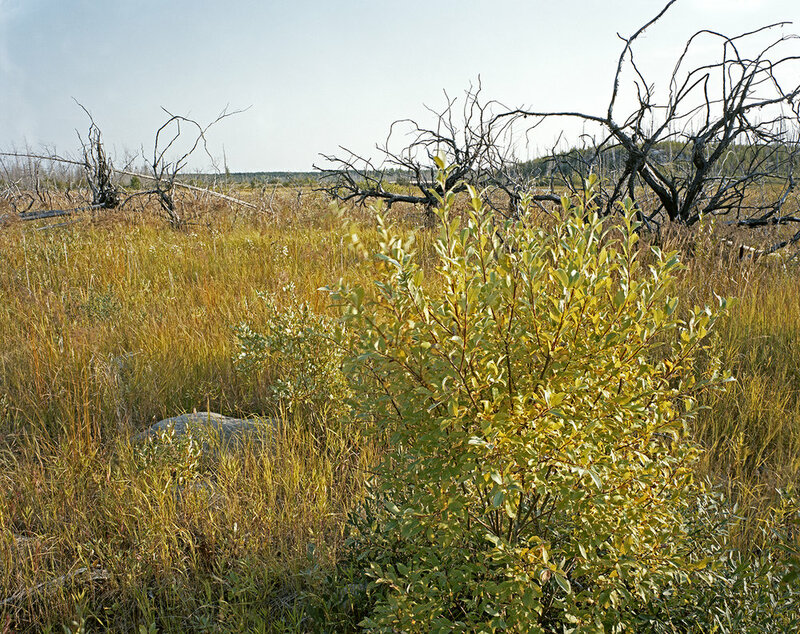 According to Miron Heinselman, author of The Boundary Waters Wilderness Ecosystem, a 3- or 4- year post-fire establishment period sets the stage for most subsequent vegetation changes, and by 10 years, the die is cast. 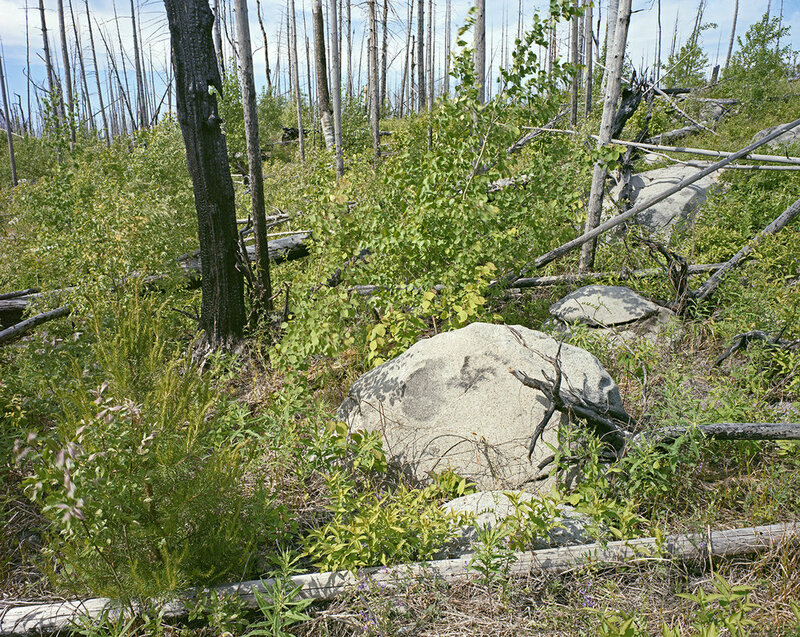 This forest type is fire-dependent, but the organic layer (soil) was so severely burned, it was unclear if anything remained in the seed-bed to regenerate the sites, or if recruitment from surrounding sites would be the primary means of re-vegetation. Would the forest re-set to its previous composition, or change? I could not have imagined the emotional effect of experiencing a fire-devastated landscape. Twenty-three miles down Forest Road 377, rounding a cor­ner and emerging from the shady canopy of intact forest, the fire area at Island River stretched before me. 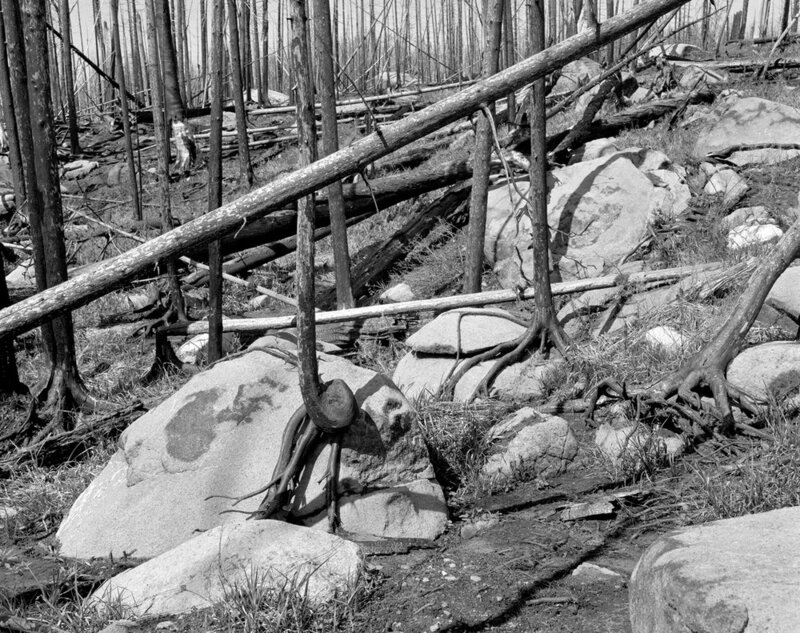 Protrusions of exposed bedrock, topography usually hidden by impenetrable vegetation, was mottled with incinerated soil and tangled and blackened masses of downed trees. Jagged spruce pointed skyward and jack pines with open cones still attached appeared frozen in time. No birds called or insects buzzed. There was complete silence except for the wind. Lawson and I threaded our way through the network of charred fallen trees. 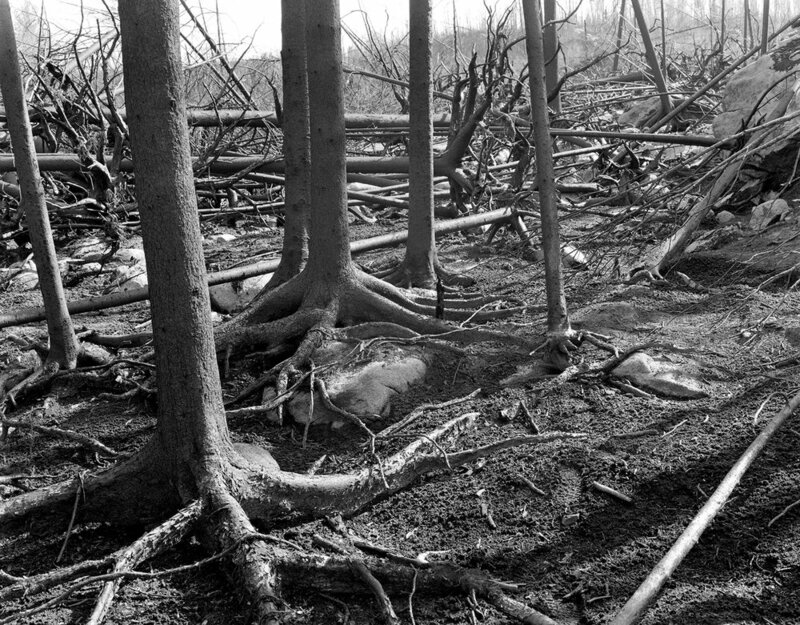 The burned soil had a strange texture – a crackly crust that broke through to a depthless gray powder. During this first visit, I photographed around exposed boulders; distinct compositional elements in this chaotic landscape. These fixed objects later functioned as landmarks enabling me to find my way overland to specific locations in this evolving, track-less landscape. At the end of an exhausting day, we were filthy and coated with charcoal dust. Each foray into the fire zone is challenging. The second year was particularly hazardous but ultimately rewarding. The first colonizers to feed on the nitrogen-rich soil appeared: Bryophytes (mosses and liverworts) hugged the ground in a richly-textured carpet and masses of pink Fireweed sprouted among the blackened trunks. Later, Bush honeysuckle, White spruce and Large-leaved aster seedlings emerged as the bryophytes faded. The incinerated soil is sloughing off and as its layers mix, deposition results. This disturbance process is especially pronounced at the edge of Island River. The upended trees in my photographs that appear to float in the river were originally on the water table. The 2011 fire occurred during a drought and burned the growing medium right out from under them. Organic matter is building back up, and through release from the existing seed-bed, wind and animal deposition, and suckering from existing trees, a meadow of sedges, grasses and shrubs re-vegetate the river’s edge. The shrub layer has attained a height of six feet and the fire area is becoming impassible. Until the canopy matures and shades the ground layer causing it to die back and open up again, access will be even more difficult. 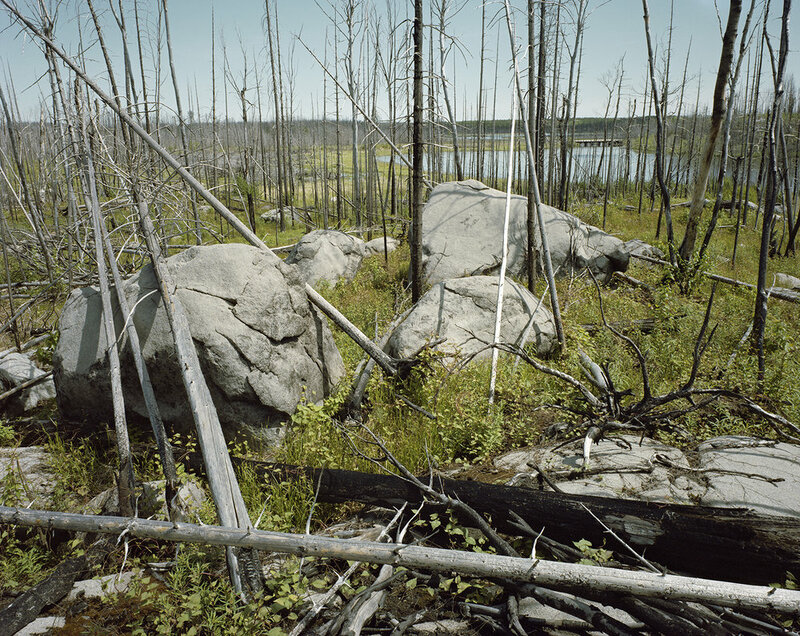 Meantime, it’s a worthwhile struggle to navigate the landscape during this critical post-fire establishment period, continuing to make photographs and short videos that reveal the landscape’s story, making the process of recovery – visible.